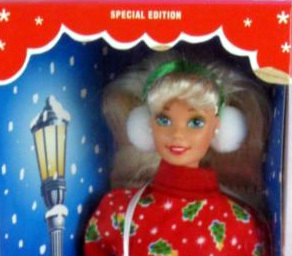 1995 Caroling Fun Barbie is ready for a cold night outside with her Red Christmas top and Green pants - she has her ear muffs and mittens ready! Do you remember this look from the mid-1990s? Leggings with tunic tops and Sam & Libby flat bow shoes? I sure do! I even had a pair of leggings that same color. This Barbie doesn't come with the Sam & Libby's - she has red boots.